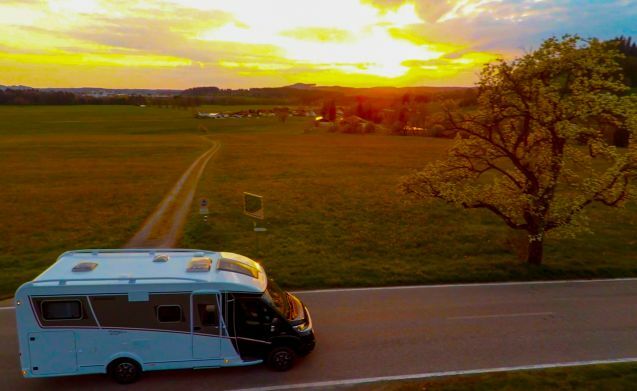 ​The Globebus GT may look like a large motorhome but it's actually from Dethleffs' compact range so it's much narrower than similar sized motorhomes making it more manageable on small UK roads. In fact it isn't much wider than our other van conversions. As a top of the range high specification motorhome, the Globebus has it all including a cavernous garage, a twin single beds that convert to a huge double, dedicated wash room with shower and toilet, a fully equipped kitchen and a huge lounge area complete with television, DVD and high specification hifi stereo. A large fridge freezer keeps things cool, a huge roof skylight keeps things airy while full central heating keeps things warm. Outside there's a wind-out Fiamma awning which along with the supplied chairs, table and groundsheet, make the Globebus a fantastic place to stay- inside or outside. ​One of the best vans available and one which is perfect for trips away to the sun. The bike rack will take up to three bikes, while the garage will take barbecues, additional outdoor furniture and even a boat and an outboard if you have one! An amazing mobile four star hotel suite that will go anywhere.